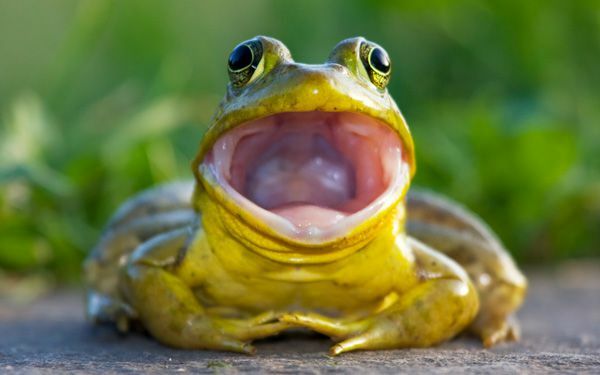 When did they start eating anyithing that fits in there moutth.Its pretty cool that they can do that ,but animals can become extinct because of the bull frogs. Wow, those frogs certainly have an appetite. These frogs have inhabited areas of western montana the 1920's and where probably introduced by farmers so they could sell their legs to be eaten. if i was a farmer and i had those frogs, i would want them to control the pests on my crops. OK, I get what your saying, but what happens when they breed and breed and breed, yeah sounds fun does it not? Good luck with that! I can't believe the bullfrogs will eat everything.It's crazy how they will eat each other. I cant believe there a threat. Can they eat dogs. 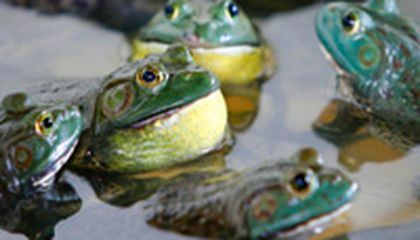 These bullfrogs are being bad to the environment. he bullfrogs are killing nature and destroying food. Just put them in a cage with food. 5They're an animal too you know. They may be killing nature, but killing is not a solution. Killing isn wrong, you should round mopst of them up and put them in a good habitat. That is cute frog. Is it rile or is it a sculptor of a frog because I did not know a frog could leave its mouth open that long so you could take a picture of it. That is crazy, I don't think a frog from around here did that! Well at least I think so. If I see one I wiil capture it and take it as a pet. This is a very interesting type of frog, but this frog could cause many problems. One of the problems the frog may cause is eating native frogs. They also spread a fungus that's suspected of causing a widespread decline in amphibians. I myself love to catch frogs, snakes, and turtles. But I did not know that bullfrogs were causing problems. I also did not know that they would eat each other. I hope pretty soon they can control the American bullfrog population.